To work with fractions, you need to know the different forms they take — reciprocal fractions, mixed numbers, proper and improper fractions — as well as the parts they’re made up of — denominators, numerators, and fraction bars. Fractions are useful when you deal with numbers that do not represent whole units. For example, when you cut a cake into two equal pieces, each piece is half of the cake. As a fraction, you write that as 1/2. 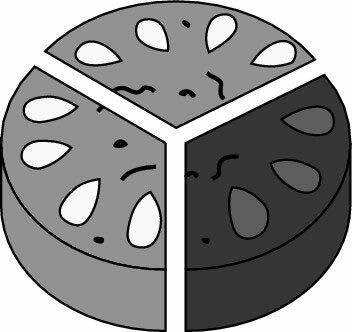 In the following figure, the shaded piece is half of the cake. The number above the line is called the numerator. The numerator tells you how many pieces you have. 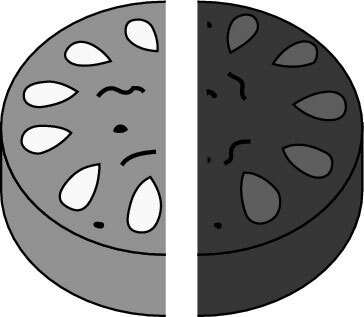 In this case, you have one dark-shaded piece of cake, so the numerator is 1. The number below the line is called the denominator. The denominator tells you how many equal pieces the whole cake has been cut up into. In this case, the denominator is 2. 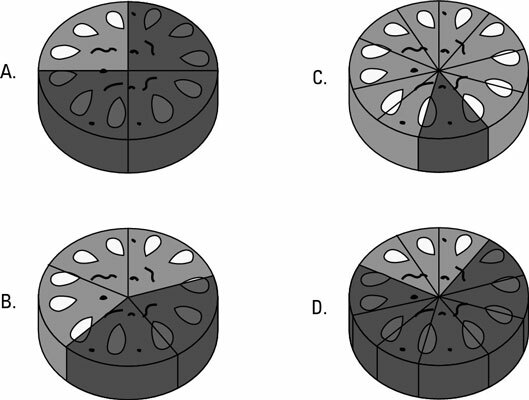 Similarly, when you cut a cake into three equal slices, each piece is a third of the cake, as the following figure shows. This time, the shaded piece is one-third (1/3) of the cake. Again, the numerator tells you how many pieces you have, and the denominator tells you how many equal pieces the whole cake has been cut up into. The following figure shows a few more examples of ways to represent parts of the whole with fractions. In each case, the numerator tells you how many pieces are shaded, and the denominator tells how many pieces there are altogether. The fraction bar can also mean a division sign. In other words, 3/4 signifies 3 ÷ 4. If you take three cakes and divide them among four people, each person gets 3/4 of a cake. The denominator of a fraction can never be 0. Fractions with 0 in the denominator are undefined — that is, they have no mathematical meaning. A mixed number is always equal to the whole number plus the fraction attached to it. Any fraction that’s greater than 1 is called an improper fraction. It’s customary to convert an improper fraction to a mixed number, especially when it’s the final answer to a problem. An improper fraction is always top heavy, as if it’s unstable and wants to fall over. To stabilize it, convert it to a mixed number. On the other hand, proper fractions are always stable.